I had always thought that travel books and travel writers were all about where to go and how to get there. “Been there, done it, got the t-shirt” mentality. But the following quote from Arthur Frommer dispelled my thinking. Frommer took his interest in people and ideas and turned it into an international travel business. His advice is one way to start thinking about the Travel Touchstones workshop, where we attempt to turn standard excursions into transformative travel. Anticipate (play out in our mind or rehearse) what you may encounter and decide how you want to experience what lies in front of you. Often setting a ‘theme’ for your travel may be sufficient to help you get more from the journey into the world. What do I mean by theme? Choosing a cultural phenomenon, like the place of food in the French lifestyle, to investigate as you meet people, eat in restaurants, or shop in grocery stores. Or say, select something about yourselves you want to explore, like notice when you feel threatened, defensive, or uncomfortable and why. Learn to pay attention to the little things. Use your senses to experience all there is along the way. Not just through the eye of the camera, but sounds and scents, textures and tastes. Note how children are viewed by the country’s culture. Watch for body language in place of verbal attempts. Put your brain and your senses on high alert to help you experience more than you typically would. Discover what kind of journal writing tools you want and need for the particular journey, find journal writing techniques that make it fast and fun and fulfilling to write, and anticipate topics and themes you may want to pursue. With tools, techniques, and topics in your toolkit, you are ready to hit the road. These are the three key areas that participants will explore in the upcoming “Travel Touchstones: Transformative Travel through Creative Journal Writing” workshops. 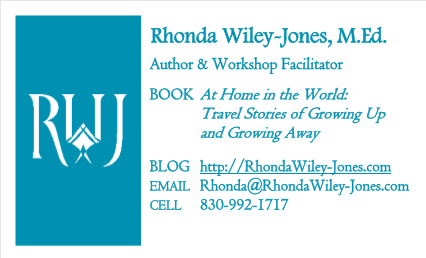 Join me and others to learn how to enjoy transformative travel through creative journal writing. For details and registration, email me at rwileyjones@gmail.com. Next Post Is Travel a Political Act? I Absolutely Think So.